This wonderful letter to City Hall was written by Sarah Groves who is both an environmental scientist and artist. Although environmental issues did not feature prominently in the October election, environmental stewardship is the backbone of a sustainable city and must be an integral part of every planning decision, especially as Vancouver aspires to be the greenest city by 2020. Continuing development pressure from urban densification through redevelopment, laneway houses, etc. compromises environmental values throughout the city and must be making the objective of planting 150,000 trees by 2020 (City of Vancouver, Urban Forest Strategy 2014) and keeping them healthy a significant challenge. In this context, protecting existing mature trees must be a priority. The request by Notre Dame School for an amendment to its 2008 development permit is a case where environmental considerations appear to be absent from the decision-making process. The proposed “minor” amendment would replace a natural turf field with artificial turf, a synthetic product with no capacity to trap carbon dioxide, none of the cooling effects of natural turf, and ecological value similar to a slab of concrete. This installation would require the removal of a stand of mature trees, a community legacy and amenity of ecological value. Even small patches of green space and trees have ecological value and can provide important habitat and networks of habitat that support biodiversity of resident and migrant species. The historical decline in tree canopy cover in Vancouver has occurred project by project in small increments that produce large cumulative effects. The proposed “minor” amendment to the development permit for Notre Dame School (located in an area of the city with low tree canopy cover) would contribute irreversibly to this trend and should not be considered without a new development permit application that will allow full and open public consultation and consideration of the proposal. Our Notre Dame Neighbours group has written many, many letters to the City of Vancouver over the past few months expressing our concern over the glaring lack of community consultation re the proposed Notre Dame McCarthy Stadium. We’ve quoted permits and traffic plans and made points about parking, noise, traffic, safety, drainage and fears for the quality of life of our neighbourhood. Notre Dame Neighbours is an informal community group. We are all City of Vancouver residents living near Notre Dame Regional Secondary School in East Vancouver. We formed in 2005 in response to Notre Dame’s plans to redevelop their school and grounds. We support other community groups who are also working to keep our communities strong, healthy and peaceful. We also acknowledge that we live on the traditional unceded territory of the Coast Salish peoples including the Musqueam, Squamish and Tsleil-Waututh First Nations. Back in 2004, the City of Vancouver was prepared to allow the school to move ahead with any construction it pleased without notification to, nor input from, the neighbourhood. A swift and strong reaction from residents convinced the City to change course and allow meaningful consultation. A City sanctioned process took place and neighbours were able to review and comment on the school’s development plan. It was clear at these meetings that while residents liked some aspects, they totally rejected Notre Dame’s proposal to remove the landmark poplar trees and construct a stadium with lighting and an artificial turf field. Neighbours were also concerned about hours of operation and did not want Notre Dame to allow outside groups to use the field. 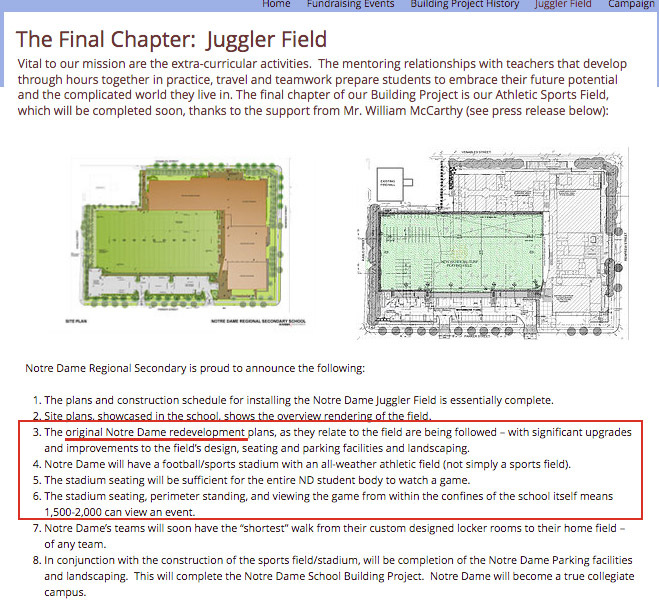 During the City of Vancouver’s consultation process and, in response to the growing opposition to the development, Notre Dame agreed to remove the stadium and its lights from the plan. They agreed to build a new grass playing field, with no stands and retain the poplar trees. The field was supposed to be for school use only, with limited hours. In the 2008, Notre Dame received approval for this redevelopment (City Permit DE410128). This plan allowed residents to stand down, confident that Notre Dame would build something positive for itself and the neighbourhood. Construction on the school buildings (Phases 1 & 2) proceeded slowly until 2016. The parking lot and field remained undeveloped. Nothing happened in 2017. In March 2018, Notre Dame quietly submitted a proposal to the City of Vancouver for an amendment to the 2008 Permit. Neighbours were not informed of this. The new plan is identical to the original community rejected proposal, only this time there are no lights. Once again, the school wants to remove the landmark poplars and create an artificial turf field within a stadium. It is now called McCarthy Stadium. It is as if the City of Vancouver permit consultation process never took place. Notre Dame Neighbours reject the schools amended plan for a stadium. We support the original 2008 plan. That is what should be built at Notre Dame.